There is a lot of disagreement over when the new generation of anchors was born. Was it the CQR of the mid 1930s or the Bügel Anchor developed in the mid 1980’s that fathered in the new era? Even when considering the shortcomings of the CQR anchor, many consider Geoffrey Taylor to be the father of modern anchor design with his revolutionary concept of the plow anchor. Shortly after that, Richard Danforth came out with the Lightweight Anchor, more commonly known as the Danforth. Another 50 years would pass before the Bügel would be developed followed by a spate of other new anchor designs that would hit the market, with a good many of them being far superior to most of their predecessors. With few exceptions such as the plow and maybe the Bügel, most of the new anchor designs would probably be better classified as scoop anchors. All seeming to exhibit the "single concave fluke" design. Also known as the Wasi, the Bügel Anchor was developed in Germany by Rolf Kaczirek. The Bügel, which has been around for quite a while now, was a radical departure from conventional anchors of the day and provided us with our first glimpse of the future of anchor design. The Bügel offers a single delta shaped, flat, sharply pointed fluke with a roll bar. The roll bar aids the anchor in attaining the correct position for setting and the sharply pointed tip allows it to penetrate most bottoms. Reportedly good performance in a wide range of Bottoms. Roll bar, however light, moves weight away from the tip. Bügel Anchors are available in galvanized or stainless steel, in sizes from 13 pounds (6 kg) to 132 pounds (60 kg.) The Bügel manufacturer’s specifications and sizing chart can viewed or downloaded here. Developed by Alain Poiraud of France, the Spade Anchor design was the first anchor to incorporate the concave single fluke. This simple design change increased holding power substantially especially in mud and other soft bottoms. It uses a hollow shank and a ballast chamber typically filled with lead to increase weight at the tip. This additional ballast is used both to aid in proper orientation once on the bottom and in penetrating the bottom during setting. The most common complaint heard with the Spade and most other scoop type anchors is that they set so well and bury so deeply that it is sometimes difficult to break them out when ready to get underway. Fluke surface area tends to be smaller than some other weight matched scoop type anchors. Spade Anchors are available in galvanized, aluminum, or stainless steel, in sizes from 6 pounds (2.7 kg) to 243 pounds (110 kg.) The Spade manufacturer’s specifications and sizing chart can viewed or downloaded here. Developed by Peter Smith of New Zealand in the mid to late 1990s, the Rocna quickly gained in popularity to become one of the major players in anchors today. From appearances, Rocna has taken the best design elements of the Bügel and Spade anchors and crafted them into their own design. Whether through the company’s good marketing or through the boat owner who has one hung on their bow and swears by its capabilities, the Rocna Anchor is fast becoming the anchor of choice for a great many cruising sailors. You can compare sizes and pricing here: Rocna Anchors @ West Marine or Rocna Anchors @ Amazon . 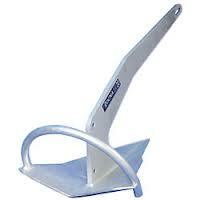 Rocna Anchors are available in galvanized or stainless steel, in sizes from 9 pounds (4 kg) to 606 pounds (275 kg.) The Rocna manufacturer’s specifications and sizing chart can viewed or downloaded here. The Manson Supreme is produced by Manson Anchors of New Zealand. Founded in 1972, Manson Anchors quickly became a world recognized manufacturer of anchors for both the recreational and commercial markets. The Manson Supreme is also approved by Lloyd’s as a super High Holding Power Anchor. You can compare sizes and pricing here: or Manson Supreme Anchors @ Amazon . The Manson Supreme is available in galvanized or stainless steel, in sizes from 5 pounds (2.3 kg) to 225 pounds (102.3 kg.) The Manson manufacturer’s specifications and sizing chart can be viewed or downloaded here.